Settling in at Joyfallee, Theodora has encountered a niggling annoyance – namely the quality (or rather lack thereof) of the resident hairdressing service. Having requested a trim to enable her to see a little more of the world than just a flutter of feathers, she is less than impressed with the Grunge-meets-Punk-meets-Indian Mohawk look that has resulted. She has asked The Snork Maiden for directions to the local shops so that she can check out the competing talents of Laura Jane Hair and Glenorie Hair Design. 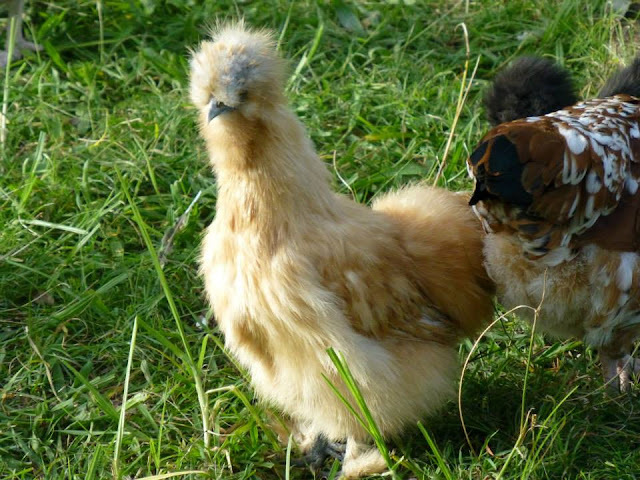 She is planning to quiz them on their Make-a-Silkie-Chicken-Look-Like-a-Movie-Star abilities, and is rather hoping for a sleek Grace Kelly style.